While you are unlikely to find a wedding photographer in Catholic-dominated New Orleans who truly specializes exclusively in Indian/Hindu weddings, I have photographed quite a few of these long and elaborate ceremonies, enough to have developed a general sense and understanding of what is going on and and what is coming up next. One particular aspect of Indian weddings that I really like is how the families play a significant role during the ceremony. These weddings are fascinating to photograph, and I always look forward to them! The receptions are always amazing as well. 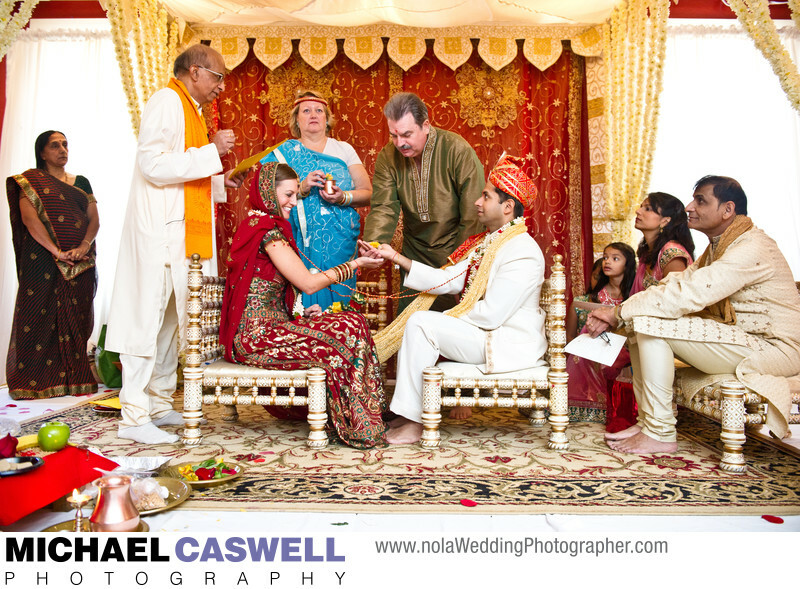 This ceremony took place at the Indian restaurant Nirvana in uptown New Orleans. This couple also had a Catholic ceremony later that same day at Holy Name of Jesus Church, and a reception that evening at historic Gallier Hall on Saint Charles Avenue. Location: 4308 Magazine St, New Orleans, LA 70115.